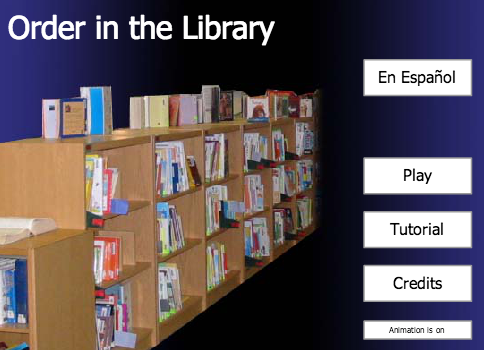 Order in the Library was developed by four teams of software engineering students in 2002-2004. The product was based on specifications the teams received from Ms. Susan Sanders, an elementary school librarian at Zavala Elementary in Austin, TX. The project was developed in Flash and has enjoyed great popularity thanks to the simplicity of its design and its utility in helping pre-college students learn how to correctly shelve books using the Dewey Decimal system. S2S Utopia is the umbrella name for a project that grew out of a Software Engineering class taught at The University of Texas at Austin from Fall 1997 through Fall 2006. As part of the course, students were organized into teams of five or six students and applied the techniques of software engineering to a real project, with clients recruited from non-profits and educational institutions. Each student team was charged with delivering a working prototype by the end of the semester, including documentation that would allow continued work. In nineteen semesters, a total of 209 teams comprised of nearly 1,200 students delivered a total of 136 different projects (several projects were enhanced over several semester). Over the years, earlier projects continued to be available for continued use under a copyleft agreement (which allows projects to be used and enhanced over time in an approach similar to the GNU project). A separate effort focused on polishing the most promising projects and keeping them available for broader use. This work was completed by independent study students as well as by students supported by two Tivoli Center of Excellence Grants (2000 and 2001) and two University of Texas at Austin UTOPIA Project Grants (2004 and 2005). As the S2S Utopia project evolved, a small team developed the Cogito System to manage the S2S projects and provide a coordinated look and feel across all of the projects. S2S Utopia was hosted by the Department of Computer Sciences at the University of Texas at Austin from 1997 through 2007. S2S Utopia provided several projects in the larger UTOPIA project that UT Austin introduced in March 2004 as a "digital gateway" to the rich resources of the university. After UTOPIA was cancelled, the Electrical and Computer Engineering Department hosted a handful of projects from 2007 through 2011. In 2012, the Order in the Library project was accepted for hosting by the School of Information Science at the University of Texas at Austin. To get more information about the S2S Project and stay abreast of changes, please join the Yahoo! group s2s-utopia by either sending an email to the address s2s-utopia-subscribe@yahoogroups.com or going to the web interface, http://groups.yahoo.com/group/s2s-utopia/. To reach Dr. Almstrum, please send an email to s2s-utopia-owner@yahoogroups.com.